One of the central goals of The Yard Ramp Guy is to optimize logistics and mitigate yard ramp shipping costs for our clients. We are always looking to arrange some form of combined freight. It's a creative process that involves a little bit of luck and a good deal of strategy. We create scenarios where we combine client A's yard ramp order with Client B’s order destined for another city along the original freight lane. With a yard ramp going from point A to point B, optimally our equipment will join additional equipment along the way. And the trucking company operates more efficiently by cobbling together a full load, even if the driver is going to a few different cities along the way. This also works if the additional equipment is not part of our business. The advantage: if a full load is, say, $2,000 from points A to B, and they can pick up the other half along the way, they’re only charging us $1,000. Again, you're paying less because you're sharing the load. For example: we need to get a couple of yard ramps to Orlando, and we also have a customer in Tampa who needs a yard ramp. We put Tampa’s yard ramp on with the other two, and that customer is paying a third of the cost. We're able to create that kind of “luck” about 15 percent of the time. Simplifying complexities such ascombined freight is yet another aspect of The Yard Ramp Guy’s approach that differentiates us from the competition. Last week, we explored the ideas of efficiency and safety as the major considerations in owning or renting a yard ramp. This week, we take a look at this from a slightly different angle: the logistics of efficiency. Imagine that you’re offloading an 18-wheeler without a ramp. Ideally, you have two guys in the truck filled with pallets that are most always heavy (sometimes several hundred or even thousands of pounds). They’ll hook chains to one of the pallets, drag it to the end of the truck, then shimmy it to the back end so that the fork tines can reach and offload. (For loading the truck, picture that same scenario in reverse). From a profit-and-loss standpoint, everything the business owner pays is multiplied by the number of employees required for a specific task. From a proactive safety standpoint, every action the employees perform physically constitutes a potential injury: each additional movement could represent a workman’s comp claim. An easier, more streamlined approach makes sense. And this is where the yard ramp comes into place. With a yard ramp, the scenario is greatly simplified and much more efficient: the forklift guy drives up the yard ramp and inside the truck; he picks the pallet up, positions it, and offloads it. The Yard Ramp Guy takes the holistic approach: With safety, efficiency, and productivity combined, everybody wins. Smooth and expedient delivery of your yard ramp is essential. You expect it, and we handle all the logistics of delivery—with updates along the way, so that communication is clear throughout the process. Proper preparation and the experience we have with transportation companies like NATCO assures seamless delivery. It’s the detail of how we deliver that very often saves our customers’ time and expense. Concluding our series on flatbeds we introduce the step deck, also called the gooseneck. This is distinguished by an elevated platform in front, angling sharply into the main well. The step deck is utilized in certain multi-item deliveries, utilizing higher and lower platforms. Naturally, you’ll want your items of larger dimension secured in the lower portion. All three flatbeds that we’ve explored—lowboy, Landoll, and step deck—have certain advantages. That said, our goal and our success is in delivery using the safest, quickest, and most cost-effective transport options. One of the most famous flatbeds is not exactly a flatbed. The Los Angeles County Museum of Art commissioned a sculpture from artist Michael Heizer: “Levitated Mass,” a 340-ton boulder. The piece was so large that in 2012 they hired Emmert International for a custom-built platform. It was 295 feet and required 196 wheels. From our view, it looks like a combination of lowboy and step deck, with a large securing container surrounding the boulder itself that looks straight out of a science fiction movie. 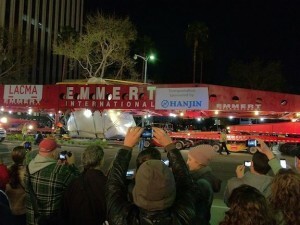 When finished, the piece was driven 106 miles through Los Angeles to the museum, at a speed of 7 miles per hour, and only at night, with tree and traffic lights removed to accommodate the space needed for transport. This required 11 days. And though we’re talking about apples and oranges, The Yard Ramp Guy proudly confirms that none of our ramp deliveries need that much time—or number of wheels—to reach your destination. The Yard Ramp Guy proudly offers comprehensive service for your yard ramp needs, and this includes delivery. While that may seem expected and obvious, the specific kind of transport we arrange can affect factors of price and delivery time. With rare exception, we nearly always arrange transport via flatbed vehicles, which are safer and more practical than container trucks—and are factory recommended. There are three main versions in that universe, and this week we delve into the Landoll flatbed. Like the lowboy, the Landoll attaches with a gooseneck to the back of a road tractor. Where the lowboy has two dips—front and back—into the containing platform, the Landoll has one slight elevation from its front platform down to the flat central platform. The Landoll is also distinguished by its winch at the front end, which lifts the platform (usually with hydraulics) to tilt the back end to the ground so that we’re able to wheel on and wheel off the yard ramp. In this way, the process does not require a forklift for placement or removal. Fewer machines involved typically means that we’ll require less time to execute pickup and delivery. Landolls are built in varying degrees of sophistication. Some have wireless remotes to streamline the tilt of the flatbed, and some actually roll the flatbed’s wheels forward and back to enable the tilt. Next week, we’ll conclude our series with the step deck flatbed. After you’ve bought or rented a yard ramp, the seemingly simple yet often complex next step is delivering it to you. Here we are talking about how exactly a yard ramp travels between depot and customer, and that’s nearly always on a flatbed vehicle. Container trucks don’t allow us to strap down a yard ramp, and nobody wants it bashing the sides of an 18-wheeler on the highway or while making turns in the city. Flatbeds are safe, sensible, and factory recommended, and so The Yard Ramp Guy utilizes them almost exclusively. In our three-part blog, we’ll explore the different types of flatbeds for yard ramp shipping. This week we take on the lowboy. No doubt you’ve seen a lowboy on the highway. It attaches to the back of a road tractor via gooseneck and is distinguished by a couple of dips—one down from the gooseneck connector and the other down from the back of the flatbed. Hence, the “lowboy” is that long center section, where we place the ramp, or ramps for transport. 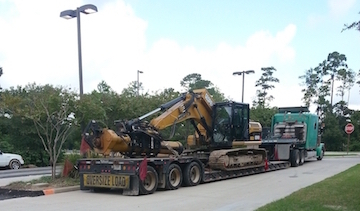 The advantage of using the lowboy comes in the ability to transport a yard ramp on its side. 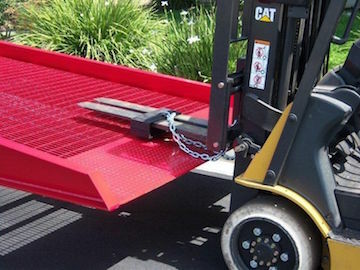 If, for example, your ramp has a width of 10 feet, placing it flat would qualify it as a wide load, which would require a lot of permits and additional expense to manage the transfer. Placing and securing the ramp on its side bypasses the wide load scenario and allows us to avoid clearance issues when traveling under overpasses. Next week we take on the landoll flatbed.